It's another rainy day in Atlanta, and here I am in another pair of pants. 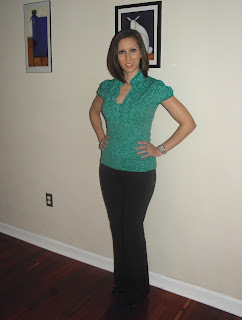 Today I have on a top from INC International Concepts and Elie Tahari black pants. I've had both pieces for several years, but it's been awhile since I've worn them. I remember getting the pants at a Bloomingdale's after Christmas sale. I like my other Tahari pants so much I was hoping I would love these just as much. While they are great pants, they do hug everything a little too tightly for my liking. And there is no way you can get away with wearing Spanx beneath pants this tight if you are worried about showcasing every bulge. Believe me... I tried! I have another series of meetings today, so I hope this outfit is professional enough for my clients. Since it's so rainy today, I thought I would take this moment to share a haircare tip I learned about five years ago. If you have fly-aways, or it's a particularly humid day, try this trick. All you need is some hairspray. Spray some hairspray into one hand, rub both hands together, then lightly touch them to your hair. This trick helps keep the fly-aways down and gives your hair an overall smoother look. It also works better than just spraying the hairspray directly onto your head! I really like the outfit. I think the top is gorgeous!